This Impact Background System Kit with 10 x 12' Black, White Muslins is a complete, lightweight and portable system. The support system will support seamless paper up to 11' in width, as well as accommodate the 12' width of any brand of muslin background. Total weight distributed across the length of the crossbar should not exceed 20 lb. It is suggested to secure the stands with gaffer tape, or weight bags when using any background setup where there are several people or active children on the set. It is suggested to secure the stands with gaffer tape, or weight bags when using any background setup where there are several people, or active children on the set. Transform basic shots into eye-catching images, in the studio and on location, with this durable 10 x 12' white Muslin Background from Angler. Suitable for both video and still photography, the heavy-duty 100% cotton fabric absorbs light while eliminating unwanted reflections. A seamless construction is topped by a 4" looped rod sleeve for hanging from a support or crossbar, while the edges are reinforced by serge-stitching on all sides. This background is machine washable with a mild detergent in a gentle cold-water cycle and can be tumble-dried on low. At the end of your shoot it can be conveniently folded and transported in the included see-through, zippered carry bag, which packs flat for efficient storage. 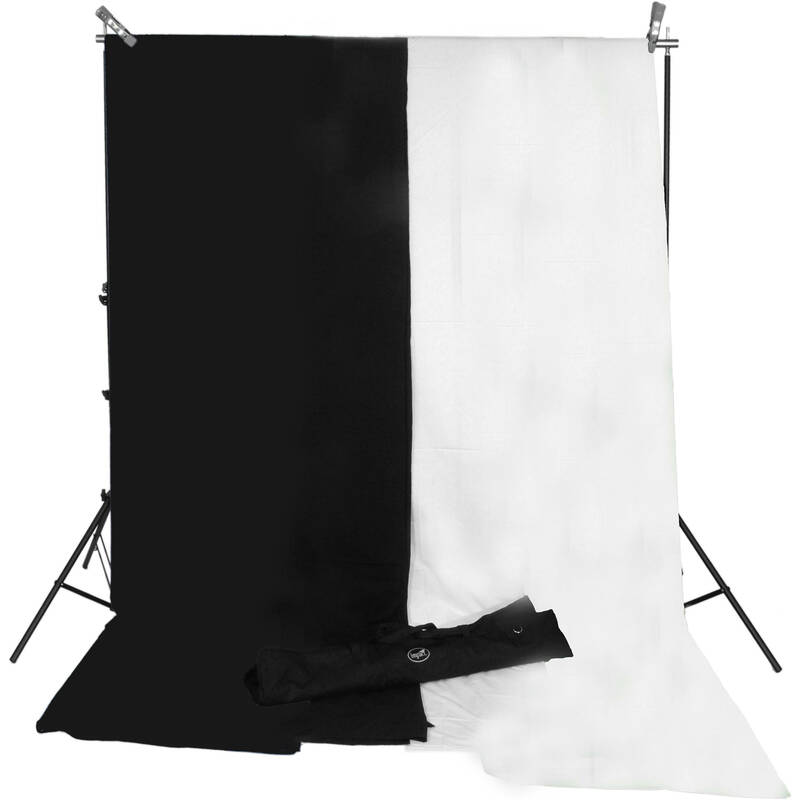 This Impact Muslin Background is great for both studio and location work. Made from quality muslin, muslin backgrounds, available in a variety of colors, can transpose a simple portrait into a real serious image. Box Dimensions (LxWxH) 41.5 x 6.9 x 5.0"
Box Dimensions (LxWxH) 20.65 x 8.95 x 7.85"
Box Dimensions (LxWxH) 19.45 x 9.1 x 6.0"
Background System Kit with 10 x 12' Black, White Muslins is rated 4.6 out of 5 by 5. Rated 5 out of 5 by Stan the photo man from Light weight and compact Just what I was looking for. Light weight and compact. This is perfect for photographers that are on the go. The cross pole comes in four sections so that you can make different widths. Carrying case holds everything together. Rated 4 out of 5 by lars from Gets the job done considering how inexpensive this is - it works well! * bring an iron. if you are using white it must be pressed... black was much more forgiving. Rated 5 out of 5 by NEC from Great product good quality affordable price. Studio use and field use. Minutes for quick set up. Very stable and good quality. Rated 4 out of 5 by Mike P. from Background System Kit with 10 x 12' Black, White Muslins by I finally opened the box and got this set up. Very easy. Great bagain for the money. Excellent for large group shots. Rated 5 out of 5 by Lincoln H. from Great starter kit. I like this to use for holding all my basic back grounds and I liked the two basic Mullins that came with it. Are these background flame retardant? No, neither the Impact Muslin Background - 10 x 12' (White), B&amp;H # IMBGW1012, nor the Impact Muslin Background - 10 x 12' (Black), B&amp;H # IMBGB1012, included in the Impact Background System Kit are flame retardant, and they should not be used around or near open flames or without proper fire extinguishing equipment nearby.